Welcome to Chicken Heaven On Earth! Keeping your chickens at the right temperature can increase egg production, improve their health, and prevent sickness and death from extreme heat or cold. Warm weather can bring on more susceptibility to bacterial related illnesses, accidental poisoning, and even death. Temperatures below 55 degrees can cause your hens to slow down on their egg production or even stop laying altogether. Extended periods out in cold weather can cause frostbite which can cause them to lose their toes. Your chicken should not be exposed to temperatures below 55 degrees or above 85 degrees. Extended exposure in extreme heat or cold can kill your chicken. Zoo Meds most popular Clamp Lamp fixture is available in three sizes: 5 1/2(14cm) 8 1/2"(22cm) or 10"(25cm) diameter domes. Made of heavy gauge painted aluminum. All three models have a ceramic socket and can be used with the Clamp Lamp Safety Cover to protect your bulbs, animals, and home. 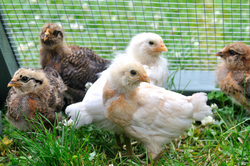 Everything you need to know in order to raise happy, healthy chickens of your very own.